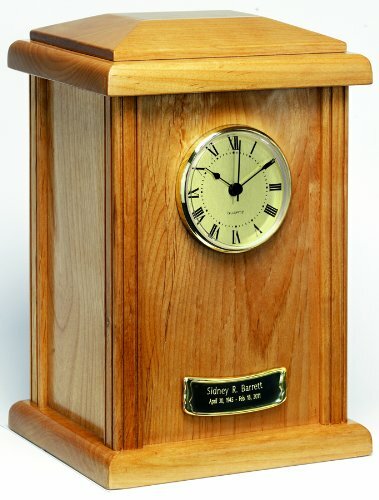 Star legacy’s natural wood clock urn is individually handcrafted and made of the finest hardwoods available. This beautiful urn features a precision quartz clock with second-hand. Our master craftsmen finish and stain each urn to perfection highlighting the wood's natural color and grain using the finest resins available --ideal for home or office. Handcrafting means no two urns are exactly alike making our naturale clock urn truly a 'one-of-a-kind' urn to honor your loved one. Ships with blank medallion name plate for personalized engraving (as shown) and batteries. Dimensions: 7 inches length x 8.5 inches width x 13 inches height. Capacity: 215 cubic inches (note: one pound prior to cremation equals one (1) cubic inch). The urn loads from the bottom with a screw bottom cap. A matching naturale wood keepsake (with clock) also available.